The cornerstone for St. Joseph Church, in its present location, was laid in the year 1957. The first mass in the new church was celebrated by Father Patrick Redahan on Christmas day 1957. The church was dedicated February 15, 1958 by his Eminence James Francis Cardinal Mc Untyre. 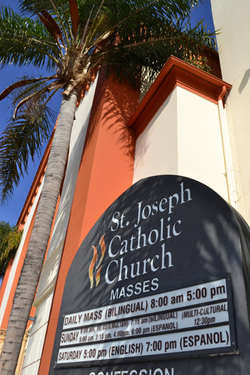 St. Joseph Church, constructed of reinforcement concrete, is of modified Spanish design and has a seating capacity of 1,300. Chimes, in its 98 foot carillon tower, toll on the hour. The Latin inscription "Venite Adoremus" (Come Let Us Adore) appears appropriately above the main entrance to the church. Throughout the church, there are forty three stained glass windows. Highlighted in the main body of the church are representations of the Blessed Mother, Sacred Heart, St. Patrick and St. Vibiana (Co-patrons of the Archdiocese), the twelve apostles, St. Paul, and St. Pius X. A very large window above and behind the choir loft depicts the towering figure of St. Joseph and scenes from the life of the Holy Family. There are two small windows at either side of the sanctuary. Shown in the mosaic beneath these windows are symbols of the Holy Eucharist, St. Peter as head of the Church (crossed keys superimposed on an inverted cross), a church situated upon a rock, and the coat of arms of James Francis Cardinal Mc Untyre, the past archbishop of Los Angeles. 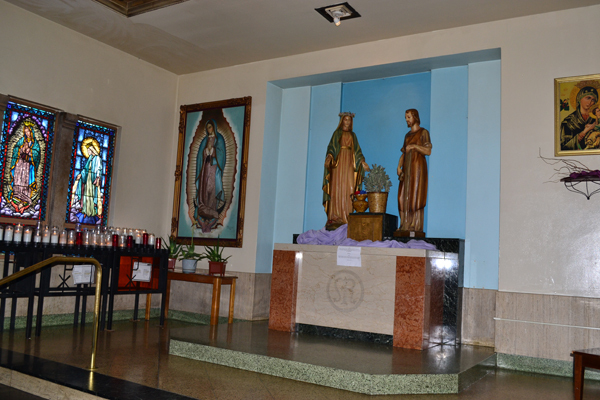 There are three shrines located in small alcoves along the inner walls of the church: (1) Sacred Hearth/Our Lady of Fatima, (2) Madonna del Cobre, and (3) the Infant of Prague. The stained glass windows in the first shrine show the Greek letters Chi-Rho (first two letters of Christ's name), and the words Alpha/Omega (the first and last letters of the Greek alphabet), which signify the beginning and the end of all things. The windows in the second shrine, the Madonna del Cobre, depict the Morning Star and the Marian symbol "M". The stained glass windows in the third shrine, the Infant of Prague, show the World with Crown and Cross and the three crosses of Calvary. The seven stained glass windows in the chapel of St. Joseph the Worker depict scenes of the Joyful Mysteries of the Rosary and Saints Maria Goretti and Dominic Savio, teenage saints. This sound proof glass enclosed chapel, serves as the "crying room" for parents with infants and small children. the Daughters of Charity in France, 1830; her appearance as Our Lady of Knock to the villagers in the town of Knock, Ireland, 1879; her appearance as Our Lady of Fatima to three children in Portugal, 1917. Other windows in Our Lady's chapel depict St. Philomena, St. Jude, St. Theresa, St. Vincent de Paul, St. Christopher, St. John Bosco, St. Anthony, and the Infant Jesus. three tiered fount with running water located in the sanctuary is now used for baptismal purposes. Statues of hand carved wood in the main body of the church were imported from Switzerland. Statues of the Little Flower and St. Anthony of Padua are located in small alcoves near the main altar. The adoring angel theme used on the ornate sanctuary lamp which now hangs above the statue of St. Anthony, and on the lighting fixtures in the main body of the church was designed by our own Monsignor Redahan. Five confessionals are equipped with special provisions for the hearing impaired. Over the main altar, constructed of marble imported from Italy, hangs a hand painted picture of the Risen Christ mounted within a carved wood baldachino. A mosaic of the Lamb on a book of scripture together with the seven seals of the Apocalypse are depicted on the smaller altar in front of the original main altar. The communion rail and grill gate are of imported marble. Flooring throughout the church is done in terrazzo.